In recent years content creation and output have quickly moved from HD to 4K and beyond, making 10Gb Ethernet the new data transfer standard for post-production shared storage workgroups and other bandwidth intensive workflows. Very affordable 10Gb Ethernet switches with RJ45 (copper) have significantly reduced the cost of setting up a 10GbE infrastructure, resulting in very rapid adoption. Even the new iMac Pro™ includes 10Gb Ethernet as its standard network interface. 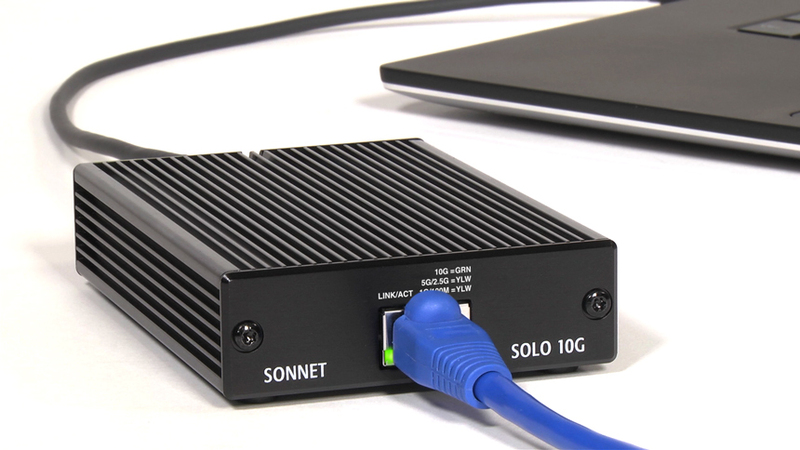 Now, for computers with a Thunderbolt™ 3 port, there is an equally affordable Thunderbolt to 10Gb Ethernet adapter—Sonnet’s Solo10G™ Thunderbolt 3 Edition adapter, a powerfully simple solution for adding blazing-fast 10GBASE-T 10GbE network connectivity to any Mac® or Windows®(1) computer with Thunderbolt 3 ports. 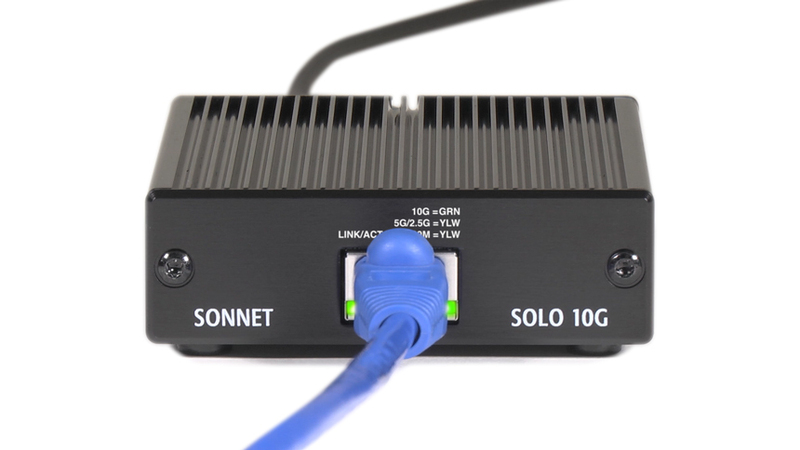 The Solo10G adapter is equipped with a single RJ45 socket, enabling it to connect to 10GbE infrastructure via inexpensive CAT 6 or CAT 6A copper cabling at distances up to 55 or 100 meters, respectively. Oh, and it’s priced at a level that seemed impossible even a year ago. Through the use of a captive cable, the Solo10G adapter’s Thunderbolt connector remains firmly connected to it at all times. Should the cable ever break, it can easily be replaced with an approved replacement cable available from Sonnet or a Sonnet-authorized reseller. 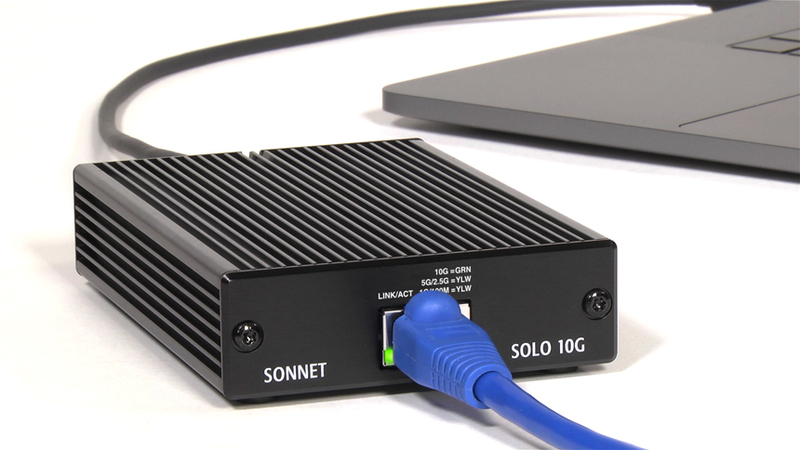 As a networked conduit into your computer, the Sonnet Solo10G was designed with essential security features. Incorporating encryption in hardware, the Sonnet adapter is protected against malicious modification of its firmware. Any unauthorized attempt at firmware modification to facilitate surreptitious computer access would render the adapter inoperable. This secure design prevents the Solo10G adapter firmware from being reprogrammed except by a manufacturer’s update using a secure encryption key. 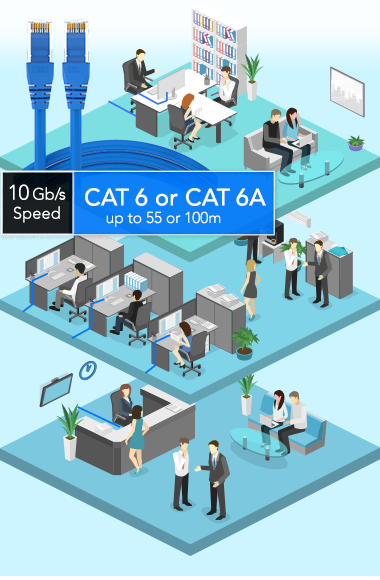 Does your facility have CAT 5e wiring installed already? You can still get a great performance gain—from 250 to 500 percent over Gigabit Ethernet speed—without rewiring! The Solo10G adapter supports the NBASE-T™ industry-standard of 2.5/5 Gb link speeds, which enables greater than Gigabit Ethernet speeds over CAT 5e (or better) cabling when used with an NBASE-T compatible (multi-Gigabit) switch or router. This capability allows you to deploy the same adapter across an organization for users supported by different Ethernet cabling infrastructures. 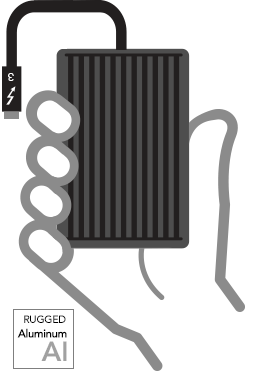 The Solo10G Thunderbolt 3 Edition adapter attains its high throughput performance and low host-CPU utilization through functions such as flow control, 64-bit address support for systems using more than 4GB of physical memory; and stateless offloads such as TCP, UDP and IPv4 checksum offloading. These processes enable your computer to perform better while large files transfers or high I/O operations take place. 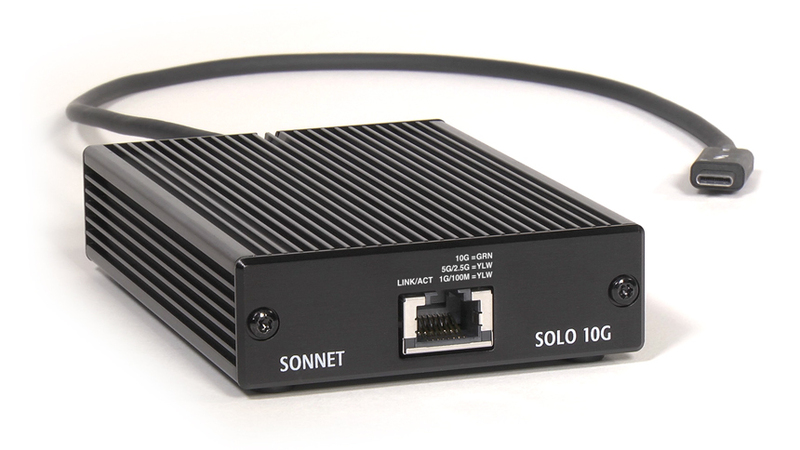 This Sonnet adapter supports Energy-Efficient Ethernet (IEEE 802.3az), which reduces the adapter’s power demands on your computer. Unlike the vast majority of 10GbE adapters, the Solo10G is pocketable—measuring a mere 3.1 inches wide by 4.5 inches deep by 1.1 inches tall—and bus-powered to enable truly portable use without a power adapter. Using the latest technologies and wrapping them in a rugged aluminum case, Sonnet designed a cool-running adapter that doesn’t need a fan, allowing silent and energy-efficient operation. How simple? 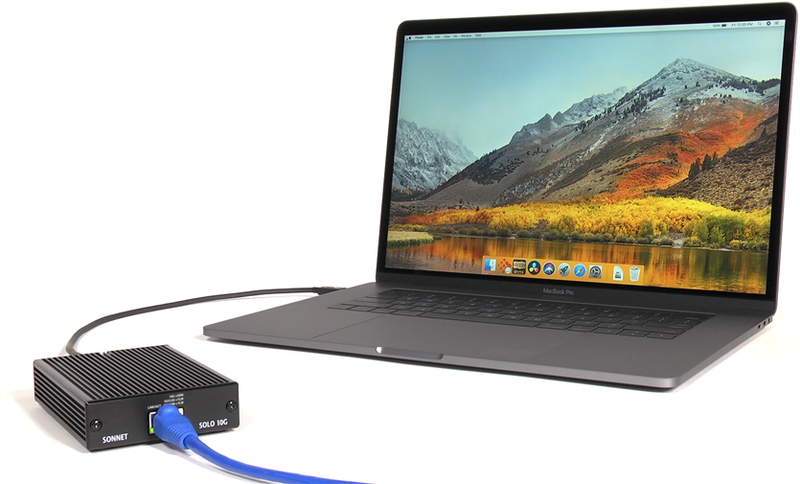 Connect the Solo10G adapter to your computer, connect the adapter to the network switch or directly to 10GbE-enabled storage, and configure the adapter’s settings through the macOS® Network control panel or Windows Device Manager. 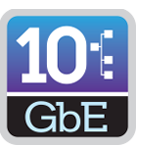 10GBASE-SR, 10GBASE-LR, or 10GBASE-T SFP+ transceiver(s) required, sold separately. 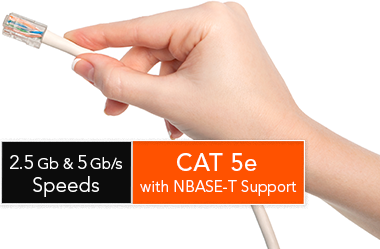 Products with NBASE-T support 5Gb/s and lower speeds over CAT 5e (and better) cables. All products listed here are macOS High Sierra compatible. Sonnet recommends macOS 10.13.4+ when connecting via SMB protocol.